Crew: Dan, Ed, Russ, Larry, Calvin, Shawn, Derick. Sponsors & Support: Ripper Motorsports, Culligan of Hasting (Russ Specht). I have always attended racing, both watching and helping in the pits. 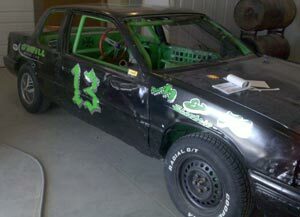 I've now raced Sport Compacts three years and am moving up to Hobby stocks. IMCA National Sport Compact Rookie of the Year Award (check), Hobby stock A Feature Win, Hobby Stock Track Championship, Hobby Stock State Rookie of the Year Award, Regional Rookie of the Year Award, National Rookie of the Year Award.